No one is taking food from whales. Where did you get your information? Almost all if not all supplemental astaxanthin is derived from natural sources, such as the microalgae Haematococcus pluvialis (see below) or the pink yeast Xanthophyllomyces dendrorhous. 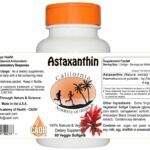 ASTAXANTHIN, a member of the carotenoid family, is a dark-red pigment which is the main carotenoid found in the marine world of algae and aquatic animals. ASTAXANTHIN is present in many types of seafood, including salmon, trout, red sea bream, shrimp and lobster, as well as in birds such as flamingo and quail. This pigment is commercially produced from the microalga Haematococcus pluvialis, the richest known natural source for ASTAXANTHIN. The microalga Haematococcus pluvialis synthesizes and accumulates ASTAXANTHIN to relatively high levels. The commercial production process is based on two distinct cultivation stages. The first is called the “Green Stage,” which starts indoors with a single-cell colony of the microalga, and continues outdoors in solar-powered photobioreactors. The aim of this stage is to produce plenty of viable, unstressed “green” algal cells by normal cell-division process (see Fig. 2). The “Green Stage” provides optimal growth conditions in order to achieve maximal biomass production rate. The second cultivation stage is the “Red Stage” (see Fig. 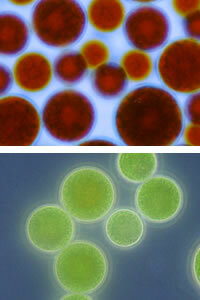 2), in which the algal cells synthesize and accumulate the pigment ASTAXANTHIN. This stage starts by subjecting the cells to severe stress conditions, mainly high radiation intensity and changes in growth media. As a result, the Haematococcus cells start to form cysts by producing thick cell walls, and to synthesize and accumulate ASTAXANTHIN in its esterified form. Cultivating the algal culture in closed systems allows an environmentally controlled process with less biological and chemical contamination. 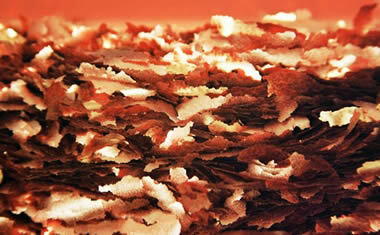 Following the “Red” process, the level of ASTAXANTHIN in the “red cells” may reach up to ~4% of their dry weight. The ASTAXANTHIN content of the “red cells” is correlated to the severity of the stress conditions, mainly to the light flux through the culture. In due time, the “red” culture is pumped to the down-processing area, where the cells are cracked (to render the pigment bioavailable), dried, and vacuum-packed. Haematococcus oleoresin is produced in an additional step, using the CO2 Supercritical Fluid Extraction process. Increasingly, both consumers and regulatory agencies are requiring extracts that contain no residual solvents. U.S. Nutra of Eustis, FL, has the technology to extract Haematococcus with CO2 and without any co-solvents. Very few companies commercially produce ASTAXANTHIN from Haematococcus pluvialis. The Hawaiian companies Cyanotech Corporation and Mera Pharmaceuticals cultivate the algae using an open pond system for the “Red Stage.” The Japanese company Fuji Chemicals operates an indoor facility in Sweden and its “dome-shaped” bioreactors in Hawaii. Algatech uses tubular solar-powered photobioreactors for both the “Green” and “Red” stages in closed, strictly controlled systems (see Figs. 3 and 4). Algatech produces its ASTAXANTHIN from the microalga Haematococcus pluvialis according to its patented biocontrolled growing process (1). The plant is located in the southern part of Israel, in the Negev Desert, near the resort city of Eilat, thus exploiting the area’s high solar radiation year-round. The major parameters used to assess high-quality commercial Haematococcus biomass and oleoresins are high ASTAXANTHIN content in the product, low levels of biological and chemical contamination, and excellent stability of the ASTAXANTHIN in the product. Producing ASTAXANTHIN in a closed system throughout the entire process (“Green” and “Red”) in an area with high solar-radiation intensity year-round, as in the case of Algatech, yields high-quality ASTAXANTHIN products (see Fig. 5). This algal biomass contains ~4% of its dry weight as ASTAXANTHIN. The production of the algal biomass in flake form (as with Algatechnologies’ dry biomass), offers additional clear advantages when an extraction process is required for the production of high-quality oleoresin with ~ 10% ASTAXANTHIN concentration. Fig. 2. Red stage of Haematococcus pluvialis culture (under the red half of the photo). Green stage of Haematococcus pluvialis culture (under the green half of the photo). Fig. 3. 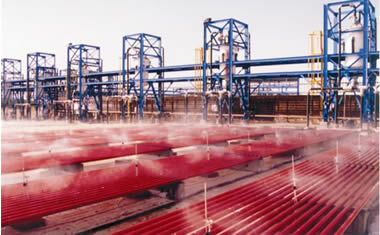 General view of Algatechnologie’s production plant in the heart of the Negev desert in Israel. Fig. 4. 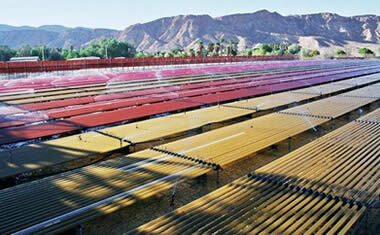 “Red-stage” solar photobioreactors – general view.